Passing loop, how to build? Topic: Passing loop, how to build? How do you construct the signalling system on passing loops without making any of the tracks one-way, not diverting trains to the loops unless neccesary? One or more passing loops. Main line is black, secondary lines and loops are red. Station areas are blue. I used to solve this in the simpler version of simutrans with a combination of normal signals and presignals or priority signals. Though there it had to be done by one-way passing loops. Also it was prone tho deadlocks if the space in the loops was more than 1+ the number of train that fit in one of the tracks in the loops. I'd like to avoid single-way loops, both for realism and for keeping the speed up. I've been experimenting with the signalbox system in the 1960-s today, but the only times I've managed to get a passing train on the secondary track in the loop I haven't been able to reproduce it. Re: Passing loop, how to build? You do need to make the passing loops one way - I am not aware of any real life railway network with bidirectional track on passing loops. I know several real life passing loops with bidirectional tracks. At least here in Czechoslovakia. Most stations here have more that two tracks, but even if there are only two, trains will use the straight track if possible. Using the passing track would mean slowing down significantly (50 or 40 km/h). However this requires a human signalman who makes decisions more complex than simutrans does. For simutrans you are best with one-way tracks and start signals only. (guarding the exit from the loop). I tried a station with more tracks (all bidirectional) and choose signals on entry (home signal) but it had a tendency to get filled with trains and stuck. Unless you have more tracks than trains. Maybe avoiding the home signals altogether and using choose signals as start signal from previous station might do the job. I don't know about other lines, but on the Helsinki-Turku Line there's many of these. Most of the line is one-track, but I believe it's well used, as there passes 1-2 trains/hour in every direction at 100-200 km/hour at the single track sections at peak. But rarely do the delays get more than ten minutes, mostly less than five. Some times the train stays or slows down at a loop beside the main line. This is some times done by the rare freight trains (freight move by night on the major lines in Finland), and more commonly it is a rural or regional train or a delayed train or a train waiting for another delayed train. IC trains on this route may not get too much delayed because of the ferries departing for Sweden from Turku. It happens sometimes other InterCity trains has to wait more than usual just so some trains can get to the harbor in time. I was surprised that platform choose did not work this way, as the ? mentioned that. If succeed, the appropriate (main route) message is given to the train. If initial attempt fails, the choose signal tries to book a route to an alternative platform, or via an alternative route to the end of the choose sign. If the second attempt is successful, the appropriate (subsidiary route) message is given to the train. So according to this it should work. At least if one places a station there, even if no trains stop there. I've tried this. Both with stations on only one track and on both. And with small stations and stations longer than the trains. So far I've managed to make a train pass on the side track on its own a few times. But that have happened when breaking deadlocks, and I haven't been able to reproduce it during normal operations. This system could be handled by a computer with the a closed circuit system. Though why it does not work is beyond me. I'll do some more testing. The problem is not the choose signal. That works just fine, routing straight if possible. The problem is to prevent trains from entering the single track section if the loop ahead is occupied. There is no need for a station for the through routing function. It simply looks for an alternative route to the next end of choose sign if the straightest one is occupied. The train is sent through when the whole route is clear all the way to the end of choose sign. If the part of the block behind the end of choose sign is still occupied, the train will stop at the signal protecting that block. I can confirm that the described practice is common in Finland. Most main lines there are single track. However, the game doesn't know the concept of a passing loop, so it cannot make the necessary decisions. The best approximation you can make is to timetable the trains accordingly. I did some testing with different signal layouts. The single lines always deadlocked, while double lines always worked. How do you set up the lights and signs on single lines? Test saves. Most will require sending the trains out. Here are two screenshots of what I have in mind. The first is the simplest and most effective passing loop for simutrans. tracks in the loop are one way, signals used are simple (2-aspect) signals (either absolute block, track circuit, or cab signal, maybe even token block could work). The only disadvantage is that the train never goes straight, but if you build it this way, it will have the same slowdown for both directions, and will slow down at the signal, where it can be expected to stop anyway. If your line is not straight you can build the passing loop between bends of the track that would be there anyway. The second shows how signals are placed in real world. The unlabeled signals are again simple (2-aspect) signals. The problem with this layout in simutrans is that the virtual signalman does not check anything else than track clearance, while real signalman, would check also if he has any free track for the coming train, to avoid deadlock. 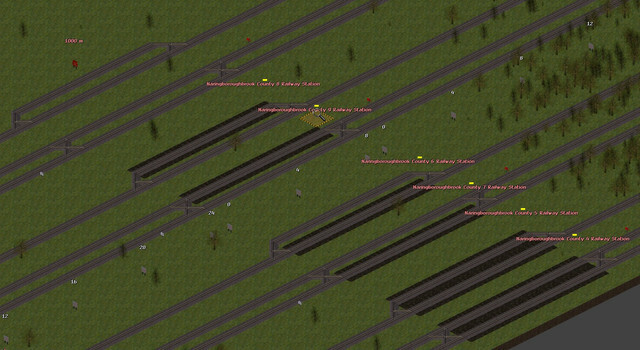 In simutrans when a train will pass the choose signal, it will clear the line and next train could immediately follow in the same direction, eventually filling the passing loop and get stuck. To avoid this you have to modify the signalling. One thing that could do it is to use double-block signals (pre-signals in standard) instead of the simple signals on loop tracks. That way the train would not leave the loop if the next one is occupied. I miss the double block signal in this version. Though so far I've only used signal box system. Maybe I'll try something else later today. In the old version I used to build something like this. Every section can hold an entire train. This creats deadlocks when there's too much trafic. Then I use to uppgrade to this one, with enough space two trains on every track on the loops. For this later one one can have about half of the line single-track when used at it most. When this was becoming too easily deadlocked I used to make double track or a new line depending on the situation. The priority signals improved the system in some ways and made it more flexible adaptive. But I don't recall right now how I did. I found this last night. In my tests, choosing the path works well without platforms.